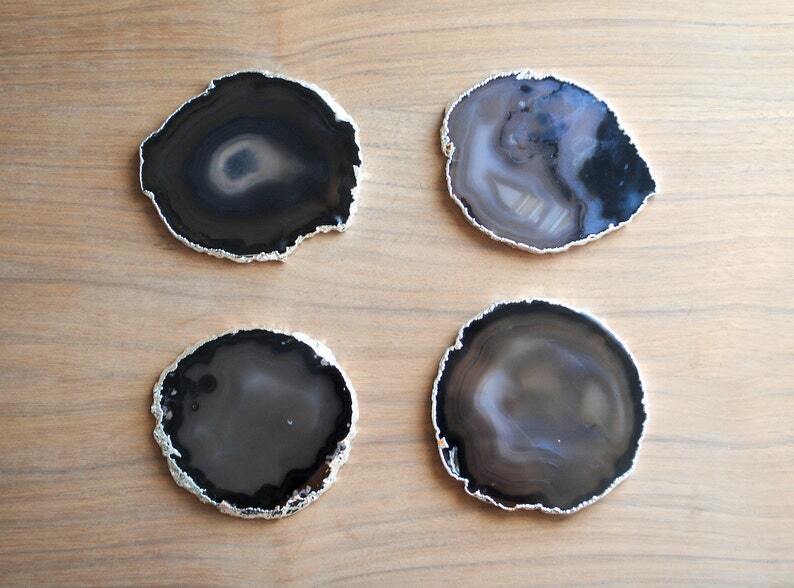 ⊿⊿ This set of 4 natural agate slice coasters measure approximately 3 1/2" - 4" in diameter each. These natural geode slices, also called druzy or druse due to the coating of fine crystals on the surface, have been polished smooth and fitted with natural cork to protect the surface of your furniture. The edges have been silver plated to give them a beautiful glammed-up look. The silver plating process involves applying and sealing a thin deposit of silver onto the surface edge of the agate slice. It is harder, shinier, and thicker than gold or silver leaf. ⊿⊿ Although the silver plating has been permanently adhered to the edge of each coaster, it will not benefit from rough tumbles, harsh cleaners, abrasives, or your dishwasher. To keep your coasters looking their best keep them dry after each use and simply wipe them off with a soft, non-abrasive cloth. ⊿⊿ The color of these coasters is a natural color without any dyes and the ones pictured are the ones you will receive (actual color will vary from the colors on your screen). They are one of a kind. ZOOM ⊿⊿ Use the zoom feature to get a closer look at item images. The last image showing the cork bottom is a stock image and it does not depict this particular coaster set.